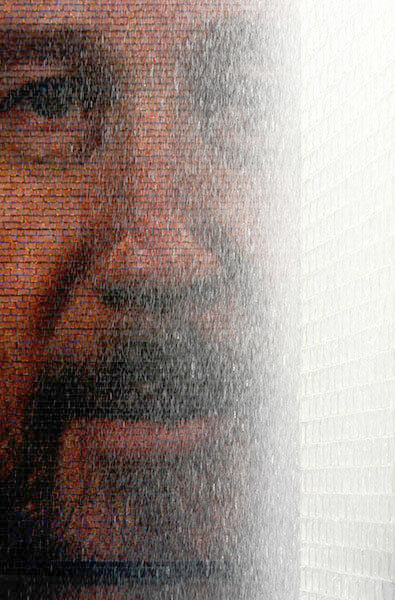 The Crown Fountain by Jaume Plensa stands in the Chicago Millennium Park. Its two glass brick towers are set at the ends of a rectangle of black granite, acting as a pool for a thin reflective skin of walkable water. The bricks on their two inner faces are backed by light emitting diodes carrying video portraits of city residents and landscapes. 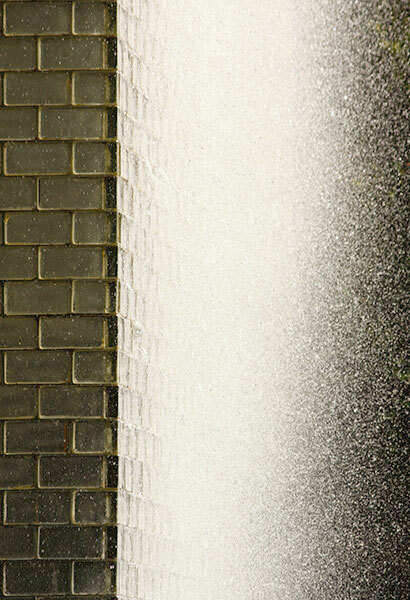 Water falls lightly down the sides of the towers and their clear glazed outer faces are colour illuminated from within. It's a fascinating combination of space, sculptural forms, video, water, and people participation throughout the day but perhaps best after dark when the imagery and light effects are most intense. I photographed briefly in an afternoon breeze that created a haze of water droplets glittering in the bright light of day. The video portraits were subdued in tone but still effective. A number of the other galleries are devoted to Chicago architecture in colour and in black and white. 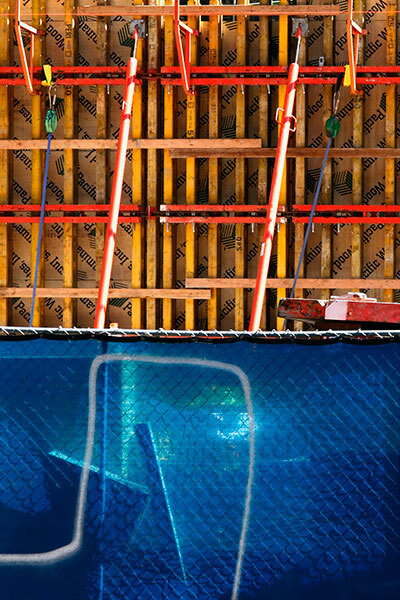 Timber and particle board shuttering for concrete pours and masking screens stand on a North Wabash Avenue building site in Chicago. 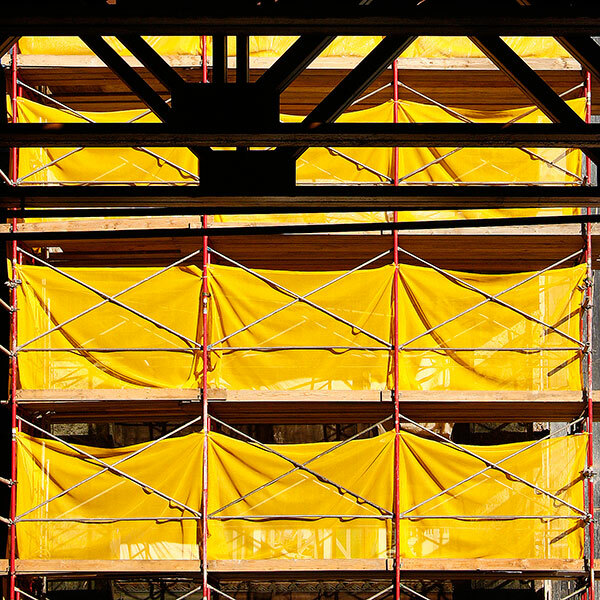 The metal scaffolding and timber boardwalks against a building on South Wabash Avenue are masked by brilliant yellow screening material glowing in the late afternoon sunlight. They create a backdrop to a fragment of the steel trusses supporting the Chicago El in The Loop. 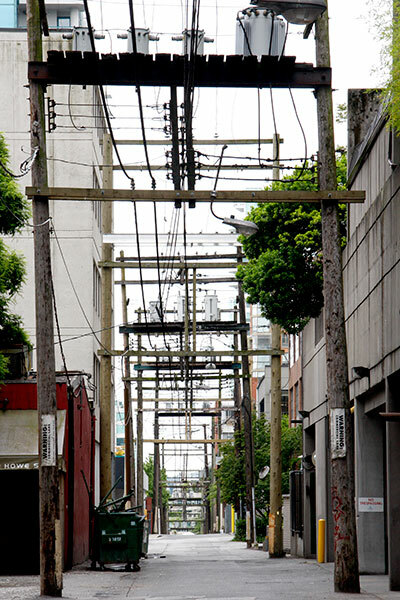 I noticed that service roads between the principal streets in downtown Vancouver sometimes gave passage to overhead electricity power lines. The perspective accompanied by the downward curve in the receding street as well as the linear composition of poles and wires appealed. 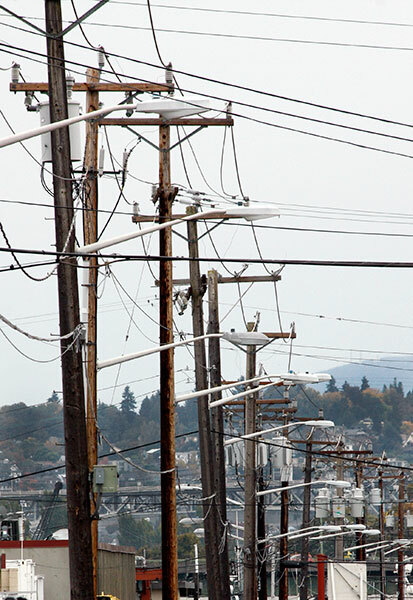 Walking towards the Ballard shipping locks to the north of Seattle I noticed this line of utility poles. Nothing spectacular I agree, but I liked the possibilities of compressed perspective and the slight variations in their verticality. Between 2007 and 2009 I photographed the gradual demolition and export of the Swan Hunter shipyard from the River Tyne to India. With a lineage from the mid-nineteenth century the Company built some 1,600 commercial and military ships. Of these, the transatlantic liner Mauretania must be the best known. Launched in 1907 she held the Blue Riband for the fastest Atlantic crossings until 1929 when it was lost to the new German liner, the Bremen; she was scrapped in 1935. A general decline in British shipbuilding in the second half of the twentieth century was echoed at Swan Hunter. After final closure in 2006 its manufacturing assets were acquired by the Indian company, Bharati Shipyards. 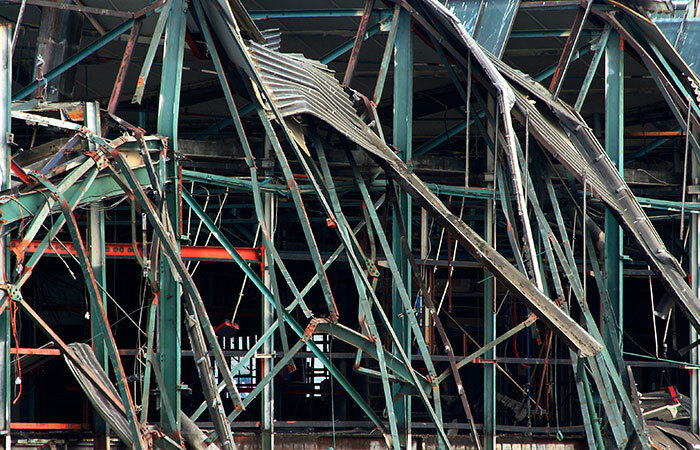 In effect, a working shipyard was taken to pieces and shipped across the world. 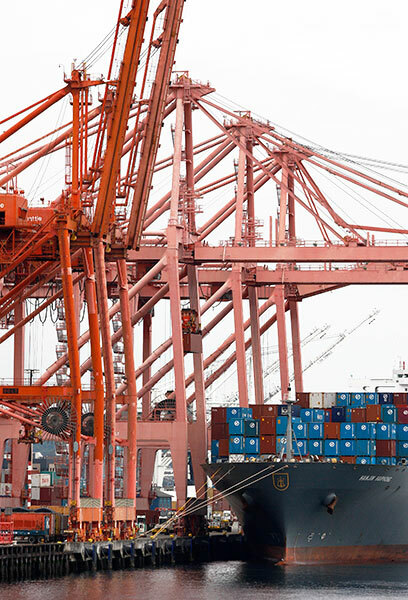 This included heavy steel forming machinery, engineering equipment, tower cranes and a large floating dock. 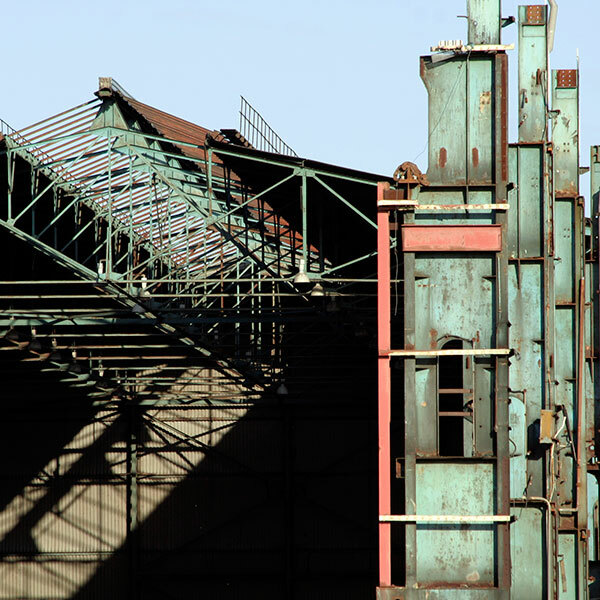 See the A WAKE FOR SWAN HUNTER 1 & 2 galleries for a selection of the dismantling photographs. 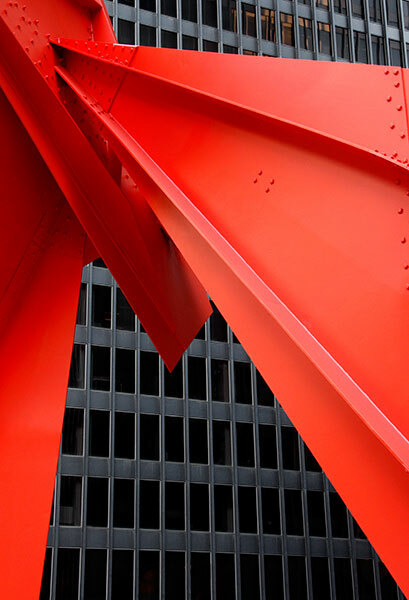 I first encountered the sculptures of Alexander Calder and the architecture of Ludwig MIes van der Rohe as a student and their creations still strongly attract. 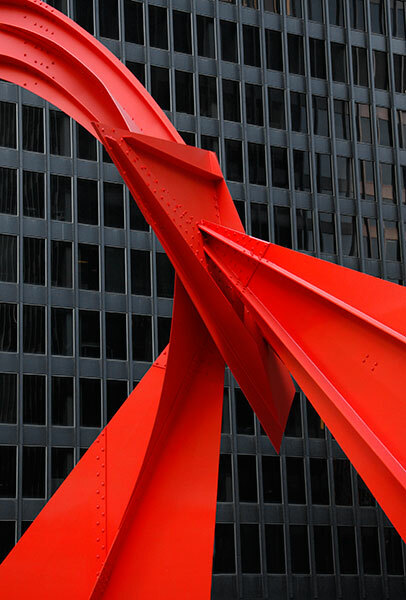 The Kluczyski Building, one of the architect's three Chicago Federal Center structures, stands behind the sculptor's ‘Flamingo' stabile constructed in vermilion painted sheet steel. Mies van der Rohe's numerous buildings in Chicago share a powerful simplicity. The matt graphite black of their steelwork frames panes of brown tinted glass. They, and the Calder sculpture, were completed in 1974. The traffic fringed open plaza is a somewhat austere setting for informal gatherings and organised events such as the colourful Farmers' Market, music performances, and demonstrations for causes and politics. The Northumberland coast has many broad and gently sloping beaches of fine sand. Beautiful to explore, they also offered relatively easy landings for the invasion fleets anticipated early in World War Two. 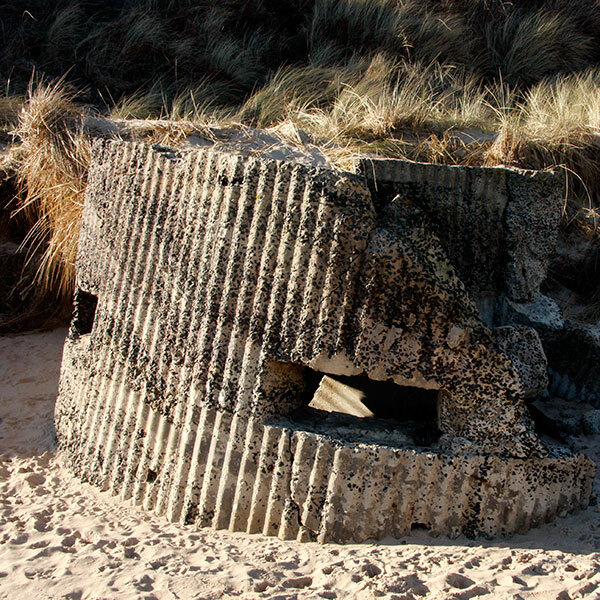 The most numerous surviving countermeasures are large concrete cubes closely spaced to impede vehicle landings and small point defensive positions constructed in 1940/41. The concrete for this cylindrical ‘pillbox' was cast in a rolled corrugated iron mould. 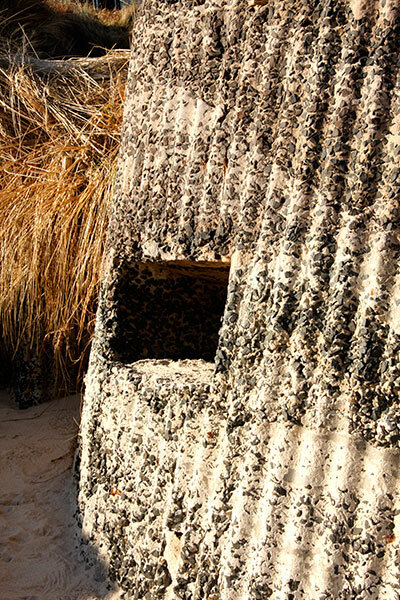 It lies fractured on the beach, its once supporting dunes cut away by the tides. Built to a number a number of ground plan shapes, sizes and interior layouts they could be mass produced but also adapted to particular local requirements. Whinstone products were produced nearby at a now closed quarry. Inclusion of such chippings in the concrete mix suggests that this pillbox was cast on-site. Compact in size, they provided armoured shelter for a small number of troops armed with rifles and machine guns or heavier weapons in the larger designs. In this second image I was interested in the abstract shapes of sand, corrugated concrete, dark gun port and dried marram grass. Washington State Ferries operate a network of coastal car and passenger ferries with two routes centred on Seattle. Heading out to Bremerton or Bainbridge Island the boats pass container docks built to receive cargoes from across the Pacific. This elegant set in pristine white is passed a few minutes after sailing from the ferry terminal. At its moorings the ferry provides a platform from which to photograph this group in gently fading red paint standing over a container ship ready to unload. 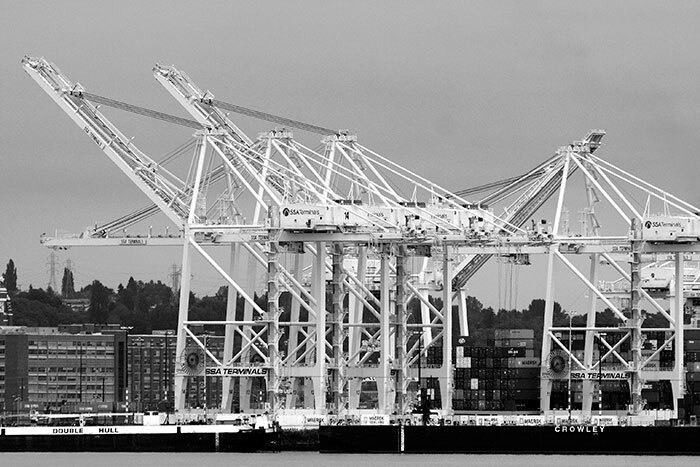 The STRUCTURES 3 gallery carries images of similar cranes in Oakland and Vancouver harbours. A monumental range of bonded warehouses was constructed on The Close in Newcastle in the early 1840s. The warehouse presented a long seven floor façade on this level street. To the rear the floors were reduced to three increasing to five down the Hanover Street gradient. It's built in red-brown brick in the robust and small windowed style so common to warehouses of the time. Closed in the 1970s, it was damaged by two fires in the 1990s and 2000s: less than one half of it survived. This image shows work underway to prepare the site for its replacement. The new steel framed and panel clad hotel and apartment block stands in marked contrast to the nineteenth century portion which seems likely to last the longer of the two. 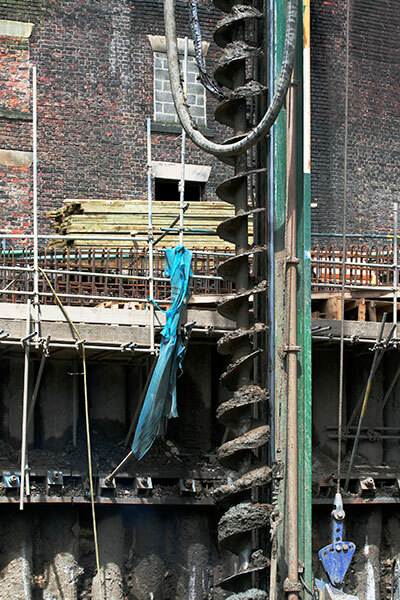 The narrow and steeply graded site required concrete piles to contain the high ground behind Hanover Street and provide foundations for the new build. 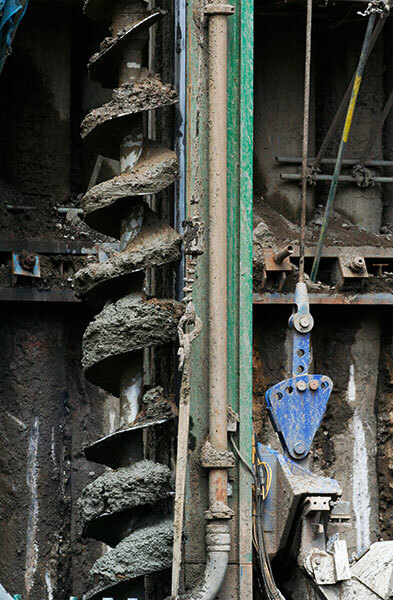 This Archimedes screw drilling machine was excavating tubes to contain their steel reinforcements and poured concrete. Mining for minerals in the North Pennine dates back to at least the time of the Roman occupation of Britain. Lead ore and its associated silver was prized and the remains of its mines and smelters can still be seen a century after the industry declined. Their survival, and that of other industrial remains in Weardale and Allendale, contrasts with their almost complete removal for redevelopment in the coal mining areas to the east. 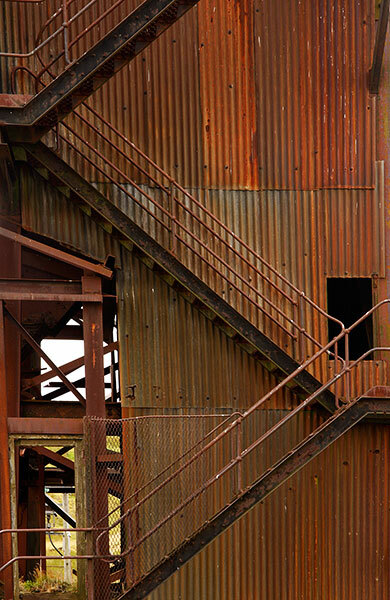 Here, the mine was closed and abandoned as a workplace just left to weather to disintegration. The steel headstock is one of two operating this deep mine producing fluorspar for use in smelting iron and steel. Its cage that carried the miners to the seams below is fixed at the top of the shaft just as it was at the end of the last working shift. Some mine workshops are decaying and the stone workers cottage stand partly or completely roofless. 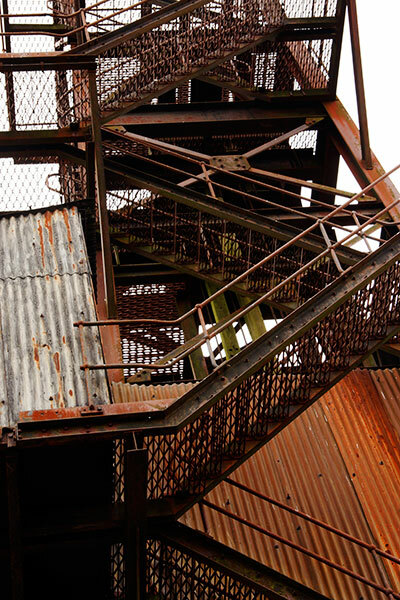 I liked the structural geometry, the corrugated iron and the red rust. See the CORRUGATED IRON gallery for more images like this pair.